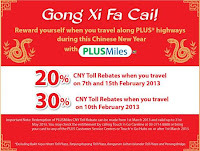 CNY Toll Rebates for PLUSMiles and Touch 'N Go card users! when you travel on 7th and 15th February 2013.
when you travel on 10th February 2013. * Excluding Bukit Kayu Hitam Toll Plaza, Tanjung Kupang Toll Plaza, Bangunan Sultan Iskandar Toll Plaza and Penang Bridge.